Two Fun Preschool Lesson Plans on Colors For A Rainbow of Learning! This fun preschool lesson plan on colors combines math and art. Students will practice making a graph and then make their own color collage. Students should know their colors and have been introduced to graphing. Review colors with the class. Talk about the different colors. Ask students to think of something that is red, blue, etc. Read a colorful book, like “Rain” by Robert Kalan or “Brown Bear, Brown Bear, What Do You See?” by Bill Martin, Jr. Ask students to think about which color they like best. Tell them that you are going to find out what the favorite colors of the class are by making a graph. On the top of your chart paper write a title for your graph – “Favorite Colors.” Then show the students the colored squares of paper that you have. You will probably only want to have five or six choices, so that your choices will fit on the graph. Tell the students that they are going to choose the color that is their favorite and then put it on the graph. Label the color choices across the bottom of the graph. Call the students up to the front a few at a time and let them choose a square and then help them glue it onto the graph in the right column. When everyone has voted, give the class a minute to look at the graph and then ask them a few questions about it. Which color did the kids like the best? The least? How many votes did each color get? Which color got the most votes? This is a good opportunity to talk about more than, less than, and equal to and to compare numbers. Now show them a model of a color collage and give each student a piece of paper that matches the color they chose for the graph. Tell them that they are going to look for pictures of their color in magazines and cut them out. Then they can write the name of their color at the top of their paper and glue the pictures on it. Could they find objects of the correct color for their collages? Did the students recognize the color in different shades, lighter and darker? You also can assess cutting and gluing on the collages. How well did they cut out the pictures? Did they use the right amount of glue or way too much? You can also informally assess the understanding of the graph and comparing numbers during your discussion of the graph. Sort and graph M&M’s or Skittles by color. Graph other favorites – seasons, types of weather, pets. This preschool rainbow lesson plan will teach students how rainbows are formed. Your preschoolers will love doing this little science experiment! Read the book, “What Makes a Rainbow?” by Betty Ann Schwartz to the class. After you read it, go back through it with the class to draw a rainbow with markers on a chart. Label the colors. Ask the students if they know how a rainbow is made. Talk about when we see rainbows and then let the class make predictions about what you need to make a rainbow. Tell them that you are going to make a rainbow for them inside the classroom. Fill a glass bowl 3/4 full with water. Set the bowl on the overhead projector. Turn the projector on. The light shining through the water will make a rainbow appear. You can also shine a flashlight through the bowl for the same result. After the students have seen the rainbow, ask them again what you need to make a rainbow. If no one knows, tell them that light shining through water makes a rainbow. After you have finished your science experiment, let them paint their own rainbows with water colors. They can use the chart you made earlier in the lesson to get the colors in the right order. You can go around and ask the students individually to tell you what makes a rainbow. Also, look at their paintings. Did they leave out any colors? Are they in the right order? Read other books about rainbows. Try “A Rainbow of My Own” by Don Freeman or “All the Colors of the Rainbow” by Allan Fowler. Use Fruit Loops or other similar cereal to make a rainbow. Just glue the cereal by color into a rainbow shape. There are so many ways your pre-k students can have fun learning about colors and rainbows. Try these fun preschool lessons on mixing colors, too! 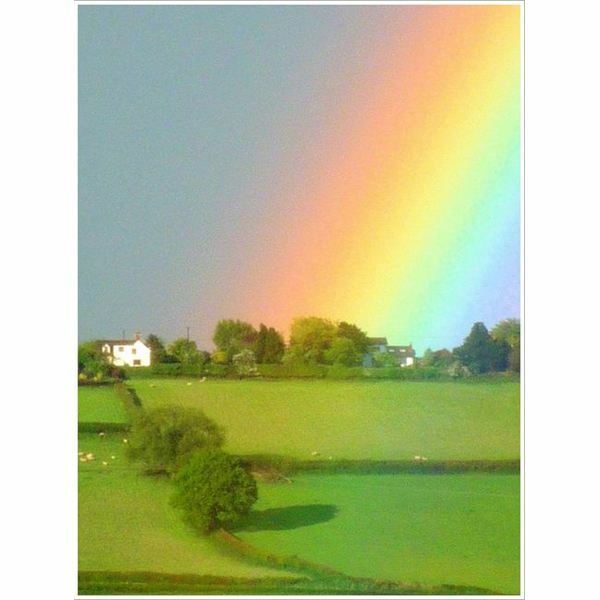 Rainbow over Linton Ridge, Herefordshire. © Copyright Linda Billinger and licensed for reuse under this Creative Commons Licence. Teaching your preschool class about colors can be a fun and creative process. Try the many ideas in this series to introduce colors to your class through songs, activities and games!